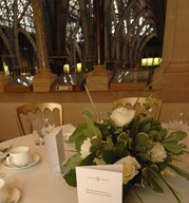 On the first night of the conference, we will host an evening banquet at St John's College on Tuesday 18 March. If you would like to attend, please purchase a place while making your conference registration. The meal will be a smoked salmon salad starter, main course of venison (vegetarian option of mushroom and stilton parcel available) with vegetables, followed by tiramisu. The price is £35 including wine. Please click here for the conference payment page. The cost of the meal at the museum is £45. This will include white wine, olives, bread, salmon on a bed of roasted tomato and courgettes with cous cous, or roasted vegetable risotto with feta cheese, followed by an apple or chocolate tart. If you would like to attend, please purchase a place online (capacity is limited).